When people think about their insurance needs, they sometimes forget about their “toys”. Most people don’t want to think about insurance when they are planning outings on their boat. Unfortunately, things happen, even while out enjoying the water. A boat policy is very similar to an auto policy. Liability coverage will protect your assets, while Physical Damage coverage will protect your watercraft. Fuel Spill Liability will pay for damage if you are responsible for an unintentional fuel spill. Wreckage Removal will pay recovery costs if you’re responsible for the removal of a covered watercraft. On-Water towing and 24-hour Roadside Assistance will give you peace of mind that help is just a phone call away if you have a breakdown, whether on the water or on land. 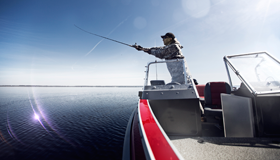 Fishing Equipment Replacement cost will cover up to $10,000 for tackle, rods and reels damaged or stolen from your boat. Personal Effects Replacement Cost will cover the cost of personal items that are damaged or stolen while on your boat.